Typography, page design, book and print production—these are a few of my printing and publishing "loves." 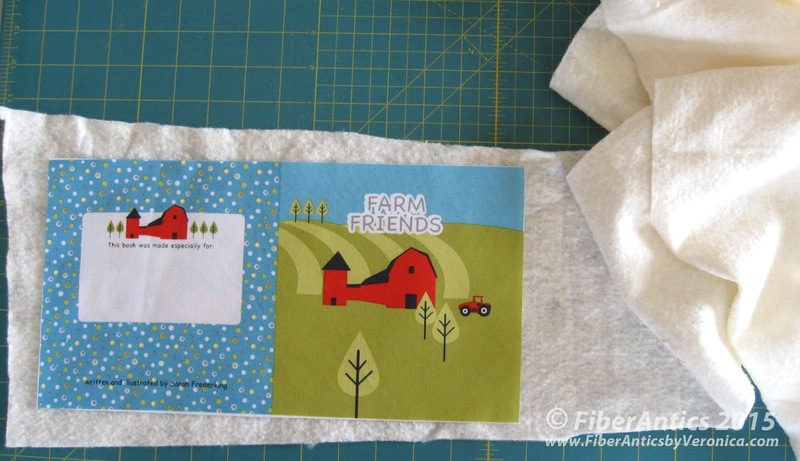 I've had a rewarding career in the printing industry and now that I work in the textile industry, making this sweet little project—a fabric book—brought back wonderful memories for me and blended loves from both my careers. 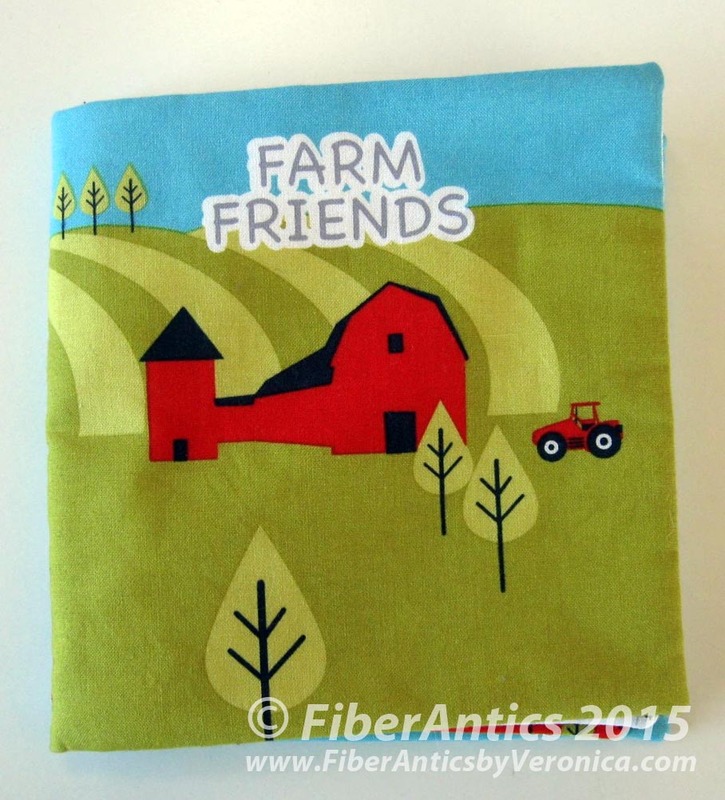 This fabric book, or "soft book," is from a fabric panel that is usually 36". 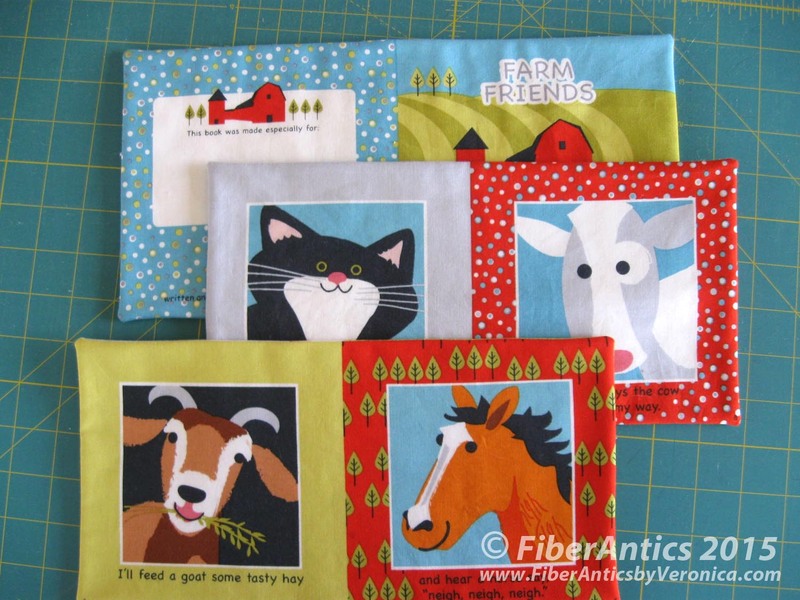 You can find a variety of these soft book panels at your local quilt shop [YLQS]. 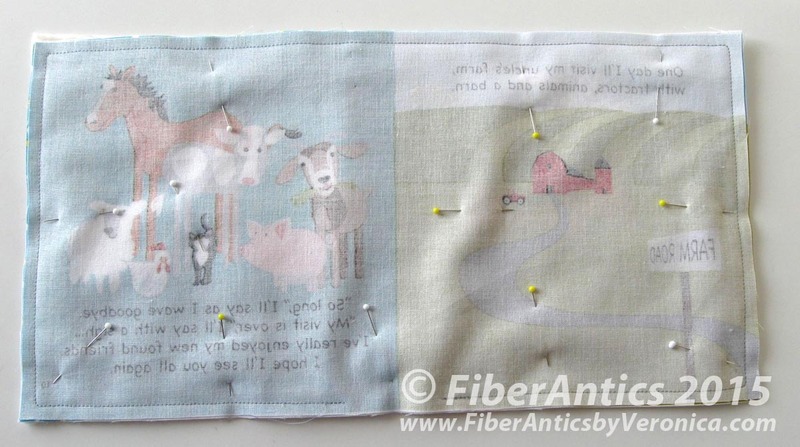 The press sheet [fabric panel] is comprised of all the 2-page spreads that make up the book before it is assembled. 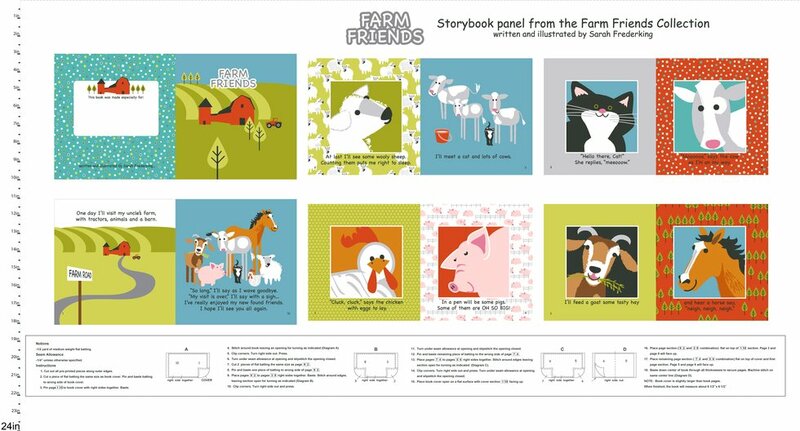 24" fabric panel for the "Farm Friends" soft book. This book is a self cover book, meaning the cover is printed on the same stock/paper as the text pages. You can see the front and back cover spreads, the inside front cover and the inside back cover, and all the book's inside pages on the panel. This is a self cover book. Shown here are the outside and inside front and back covers. Since the book is already paginated, you don't have to worry about page imposition and the story reading incorrectly. With ink-on-paper, when a press sheet is automatically printed on both sides with a single pass through the printing press, it is called "perfecting." This term is commonly used with offset lithography. With a digital printer, it is called "duplexing." 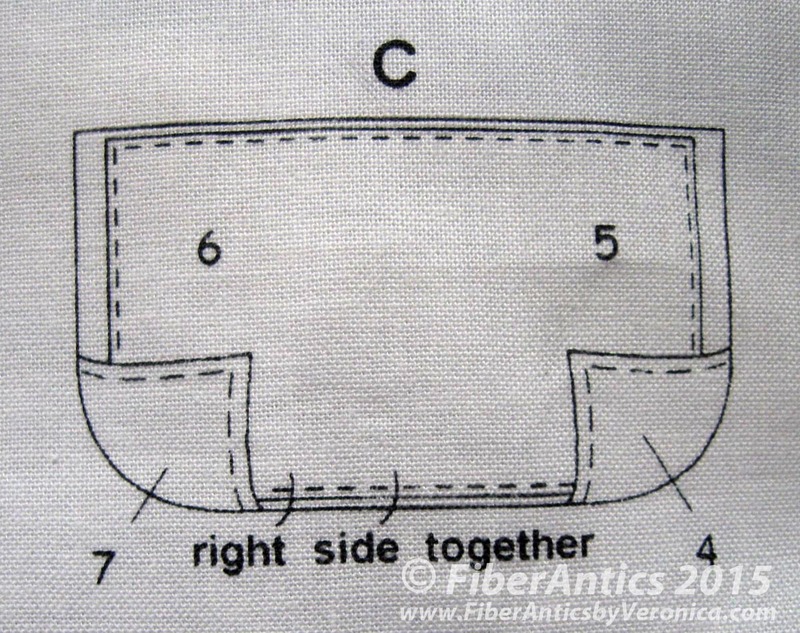 With the fabric book, the single-sided spreads have to be trimmed out and manually stitched together back-to-back to simulate two-sided (duplex) printing. 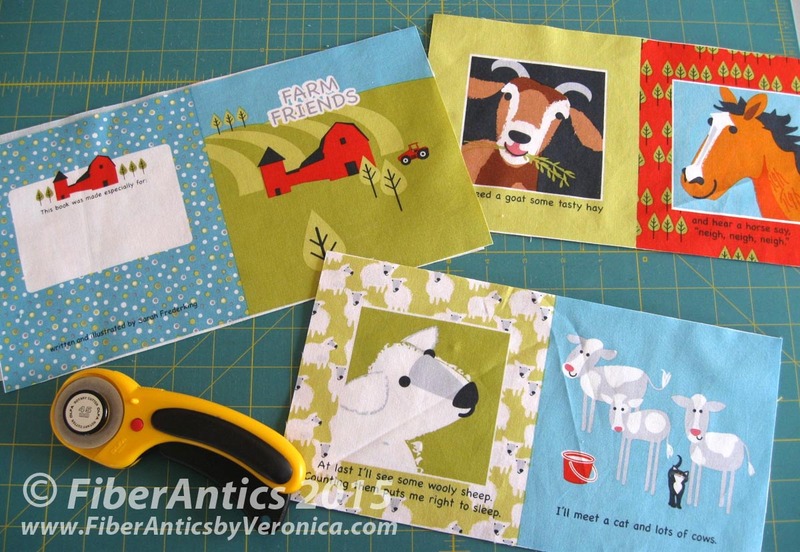 Cut out the fabric page spreads. 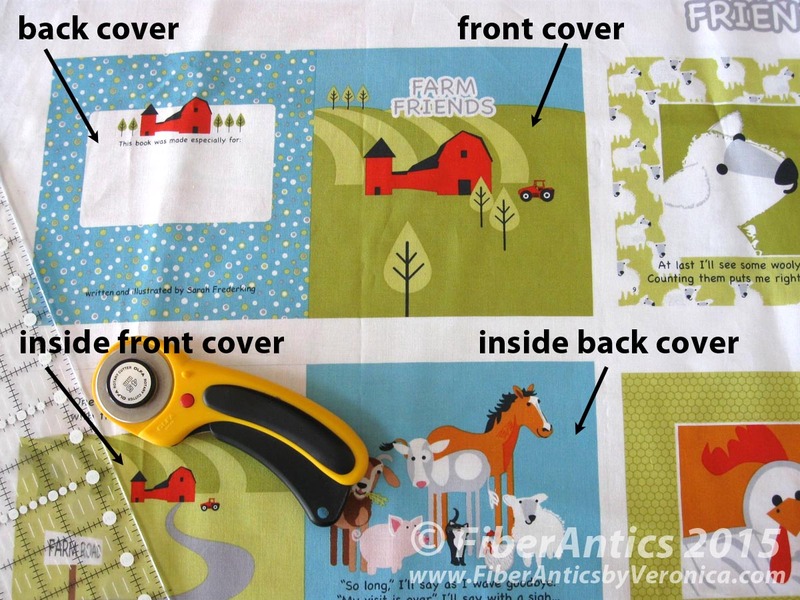 Book assembly instructions are printed on the fabric panel. The diagram shows the pagination. 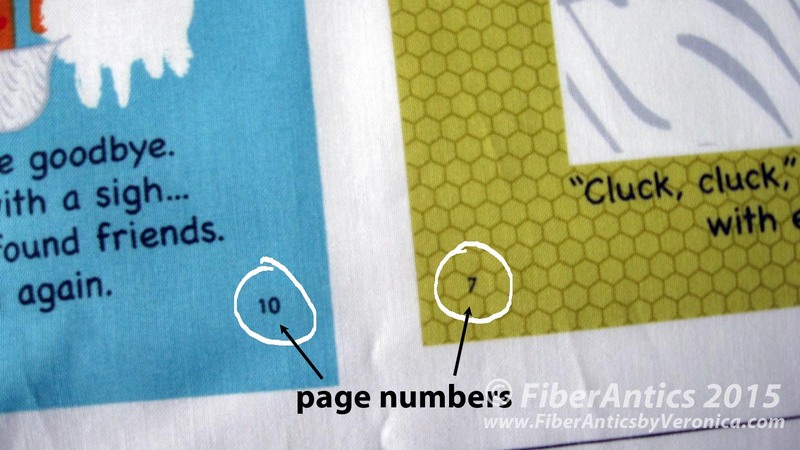 Page numbers are printed on the pages. … It was slightly disconcerting for someone with a publishing background to find that this book did not follow the page numbering convention. For English texts (texts read from left to right), the odd numbers should appear on the right-hand (recto) pages and the even numbers on the left-hand (verso) pages. Got long lengths of batting trimmings? Here is where they come in handy. Batting trimmings were used for this fabric book. Take the corresponding page spreads and sandwich them together with a piece of batting. 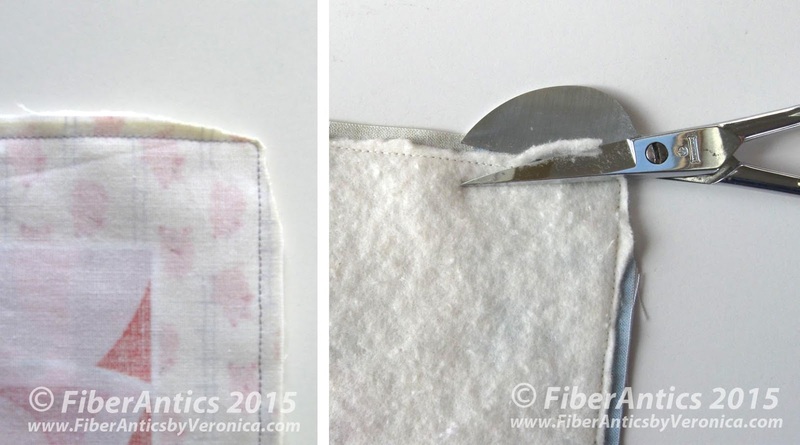 I used long scraps of low-loft 100% cotton batting—trimmings from larger quilts. Pin and sew around the outside of the sandwich, leaving an opening for turning. I did a little back stitching on either side of the opening for strength. Sandwich, pin and stitch the book spreads. 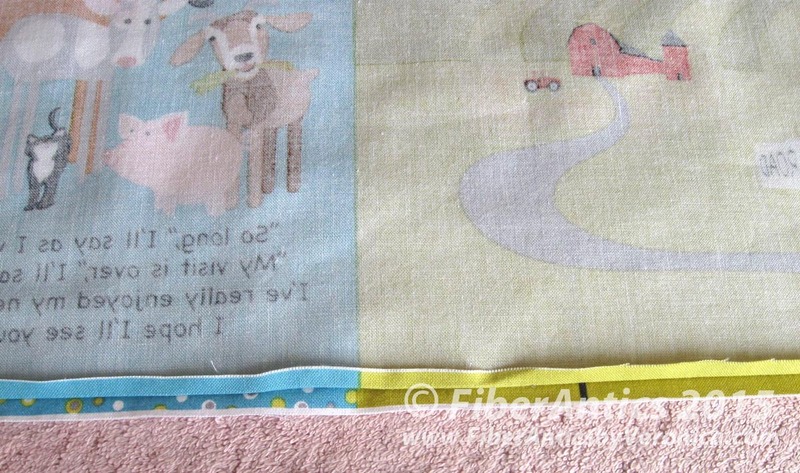 The corners and batting were trimmed close to the stitching to reduce bulk. Trim corners and batting to reduce bulk. Before turning, press open the seam allowances on the side with the opening. This will provide a straight crisp edge for finishing. Turn the piece right side out through the opening. Use a point turner or bone folder at the corners. Press. Press open the seam allowances before turning right side out. Two 4-page signatures and book cover.